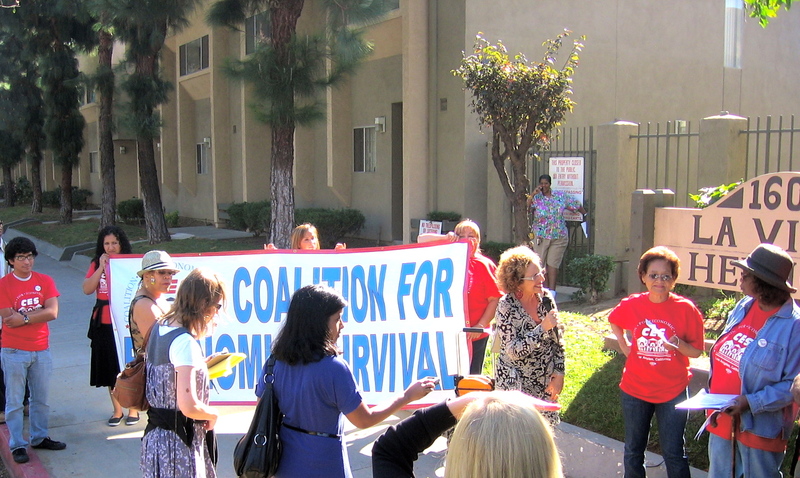 The Coalition for Economic Survival (CES) has been providing outreach, training and organizing assistance to tenants living in HUD subsidized housing where owners are seeking to opt-out of the project-based Section 8 rent subsidy contract or prepay the HUD subsidized mortgage, thus removing federal rent restrictions for over two decades. CES’ work has resulted in many subsidized housing units being preserved as affordable. But, many more units are still at-risk. This report describes the crisis that is upon us. CES tenant leaders living at an at-risk HUD subsidized housing complex explain their fight to preserve their affordable housing to United Nations Special Rapporteur on the Right to Adequate Housing Raquel Rolnik in November 2009. La Villa Hermosa Apartments is in South Los Angeles close to the University of Southern California where many landlords have been pushing out long term, low rent tenants in order to get higher rents from short term USC students.